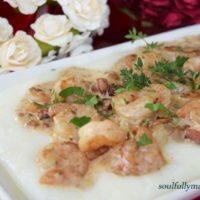 This Shrimp and Grits with Andouille Cream Sauce is just the thing to spice things up for your dinner for two at home! 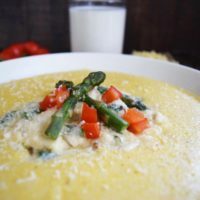 It’s the perfect amount of heat balanced with luscious, velvety, creamy, cheesy grits. Can you tell I get so excited about eating this??!! I am pretty sure your Valentine will get excited when you make this too! My husband and I ate at a boutique hotel in St Augustine years ago, and had the most amazing Shrimp and Grits. I don’t know why I didn’t beg the chef for the recipe, but I came home and worked on recreating it. 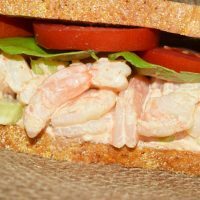 I couldn’t believe I waited so long to make this at home because it is so flavorful and easy to make. Maybe it’s because it’s a bit of an indulgence with all its creamy goodness. 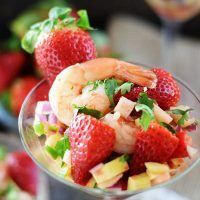 But, that makes this an ideal dish to celebrate a romantic dinner for two! Let’s get started making the dish! We don’t want to keep your hot date waiting! Bring, 2 ¾ cups water (or chicken broth), grits, and salt to a boil over medium high heat in a saucepan with lid. Stir in 1/3 cup cream, 2 tablespoons butter, and cheese, reduce to medium low to low and cover. Simmer, stirring grits occasionally, until grits are tender about 5 to 6 minutes. Meanwhile, melt one tablespoon of butter in a skillet over medium high heat. Add shrimp and cook for one minute. 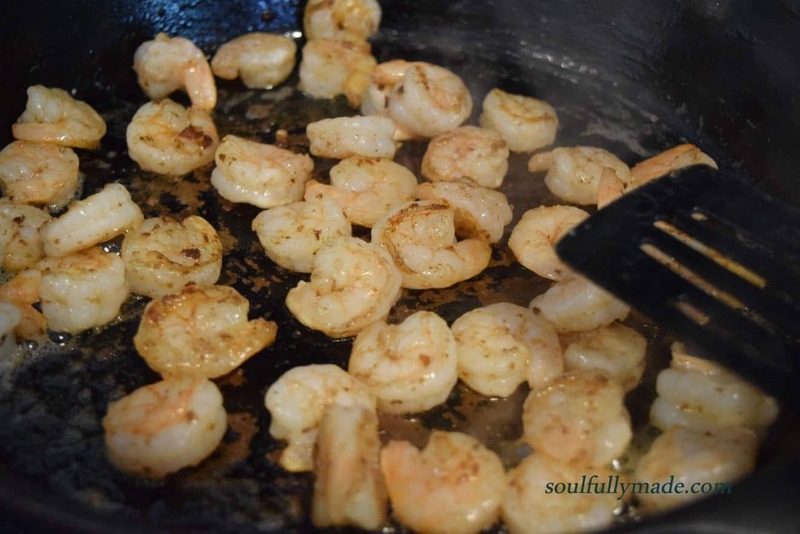 Remove shrimp with a slotted spoon (as to keep drippings in pan) and transfer to a bowl. Add bacon, sausage, onion, bell pepper, and garlic to skillet. Sauté until onion and pepper begin to soften, about 3 minutes. Add wine. Boil for about 3 minutes or until reduced by half. Add ¾ cup cream, parsley, thyme, cayenne pepper, and shrimp. Simmer until shrimp are just opaque in center and sauce is thick enough to coat spoon, about 3 minutes. Season to taste with salt and pepper, if desired (I usually don’t need to add any). Now you are all ready to plate. Spoon grits onto plate and top with Shrimp and Andouille Cream Sauce. Sprinkle with some fresh parsley and you could add a little parmesan cheese too! Now you are ready for that spicy dinner with your red hot valentine! Bring, 2 ¾ cups water (or chicken broth), grits, and salt to a boil over medium high heat in a saucepan with lid. 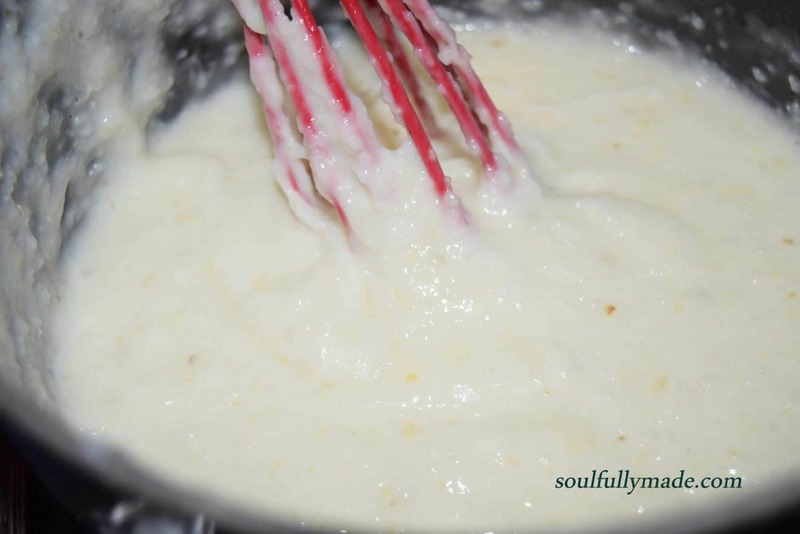 Stir in 1/3 cup cream, 2 tablespoons butter, and cheese, reduce to medium low to low and cover. Simmer, stirring grits occasionally, until grits are tender about 5 to 6 minutes. Meanwhile, melt one tablespoon of butter in a skillet over medium high heat. Remove shrimp with a slotted spoon (as to keep drippings in pan) and transfer to a bowl. 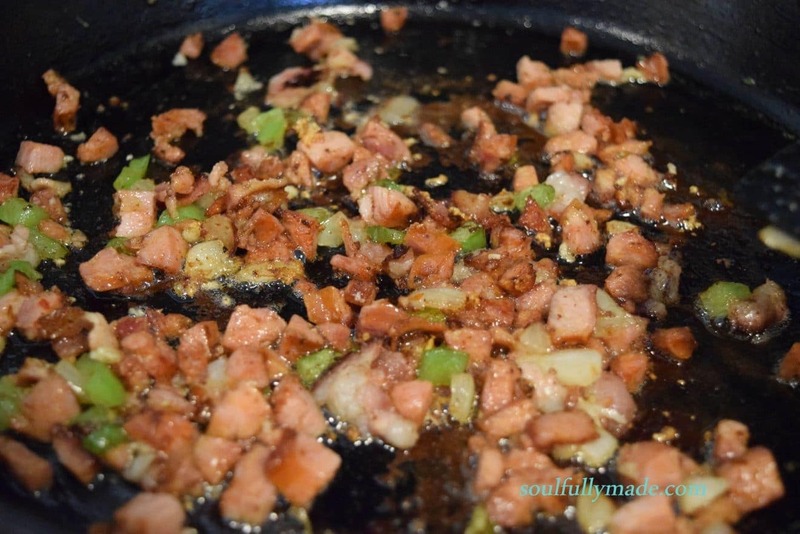 Add bacon, sausage, onion, bell pepper, and garlic to skillet. Sauté until onion and pepper begin to soften, about 3 minutes. Add wine. Boil for about 3 minutes or until reduced by half. Add ¾ cup cream, parsley, thyme, cayenne pepper, and shrimp. Simmer until shrimp are just opaque in center and sauce is thick enough to coat spoon, about 3 minutes. Season to taste with salt and pepper, if desired (I usually don’t need to add any). 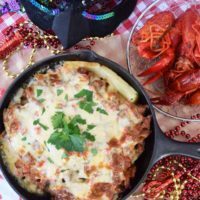 Enjoy these other delicious Easy Dinner Recipes from #SundaySupper tastemakers! 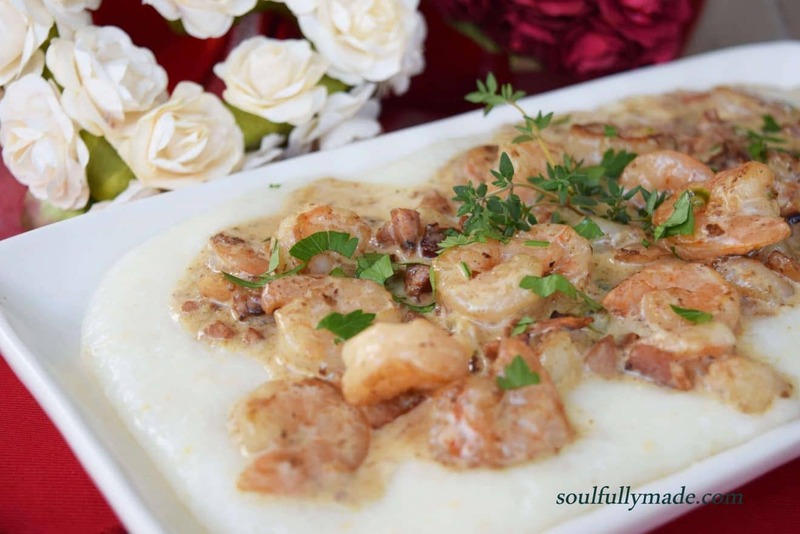 I love a good shrimp and grits recipe and this one looks like it really delivers! Oh that cream sauce is making my mouth water! This MUST go on our menu soon! Maybe for Mardi Gras! it would be perfect!! Thank you Renee! The cream sauce makes the dish! Let me know what you think if you try it! This looks delicious can’t wait to try it. Thank you Jennifer! Let me know how it turns out! Oh, my goodness! 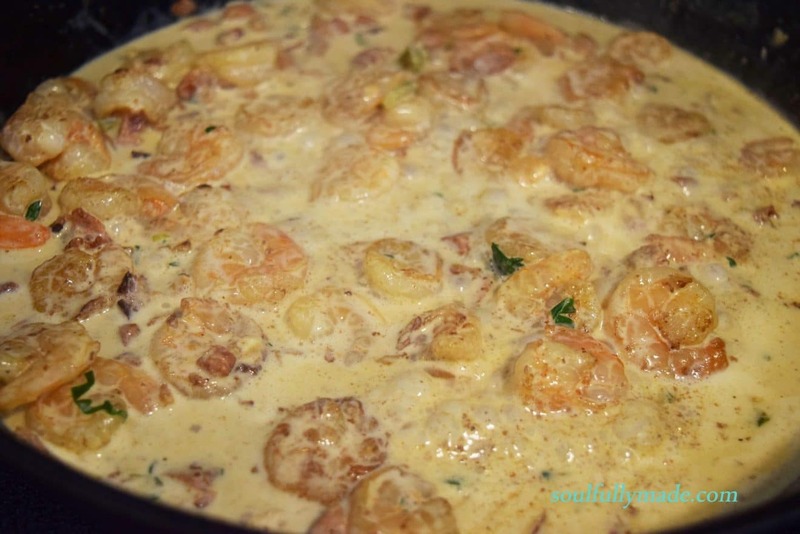 That creamy sauce with shrimp. It’s perfection served over those grits but I could just eat them with a spoon straight from the pan, Nikki! Stacy you are not kidding! I could eat them straight out of the pan too! Yummm Shrimp and grits is one of those combos I wouldn’t try for a long time and then LOVED upon first bite. What a great idea for a Valentine’s Day dinner at home! Thanks for sharing, Nikki! One of my favorites too! A great indulgence for Valentine’s Day! Thank you for stopping by, Marion! Sounds like a tasty sauce, and definitely comfort food too. Thank you Caroline! It really is! Don’t you just love comfort foods? I know I do. This is one luxious dish worthy of date night WOW!! Love it! Yes! Only the best for date night! Thank you Kristen! Yum….what a wonderful dinner to serve up to your Valentine. Yes! Gotta have something special for Valentine’s Day! Thank you Wendy! I’m glad you share in my love for all things Southern! Thank you for stopping by Ninja Baker! I look forward to following along with you! Can you believe I have not made shrimp and grits before. I will have to try this recipe! I don’t know why it took me so long to make this one at home! Let me know how it goes! It really is easy and so delicious! 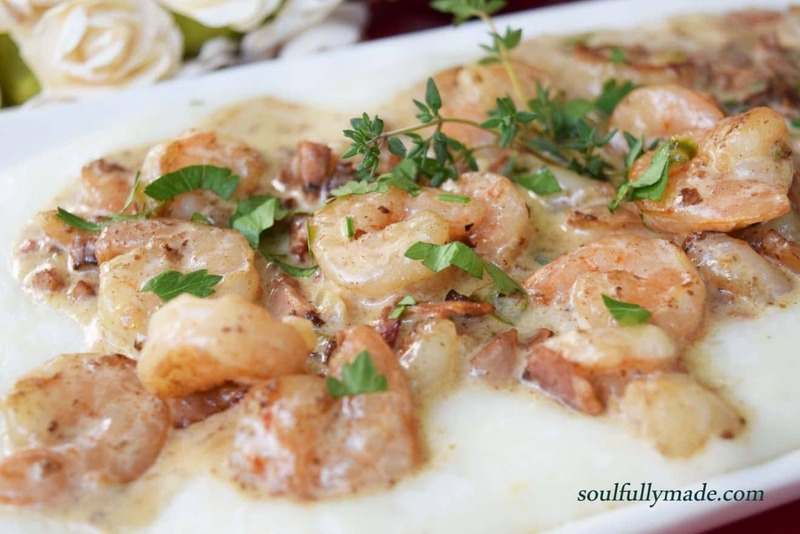 Your shrimp and grits looks amazing! Perfect for Valentine’s Day!! Thank you Liz! It is a great indulgent meal! MIne to Cindy! Thank you for stopping by! I look forward to following along with you!